You gotta ask yourself, if Howard wants to run, why not as a Democrat? Maybe because his views on entitlements will turn off a lot of Democratic voters. Perhaps toying with an independent run that gives him no chance of being elected and would only siphon votes away from the Democratic nominee hints at some dark and obscure motive. In any case, Howard should either compete in the Democratic primaries and caucuses, or stay out altogether, or run as a Republican, and if he won’t, then ignore him. Why not wait to hear his actual policies? If you think party labels are a good deal I will sell you my copyrighted “Trump for President 2020” .. showing the man as Democrat. He certainly could have run on that ticket since, unlike Howard, Don Johnny has no real beliefs. One argument for an independent run is that he gets to avoid the party catechism. Bernie is as a good as Donnie in pushing slogans. Medicare for all is, as Schultz says, a fraud. But, could Howard run as a Dem while debunking that idea? As for contributing to a Trump victory, I suppose that you are too young to remember how that worked with Ross Perot? So you want to support Trump as a democrat? It could make the Presidential debates more interesting if the major parties let him debate. Will there be charts? IN theory he should be able to carry Washington state as a favorite son. While unlikely that could be enough to throw things into the house and he could come out of that as the winner. Not a unicorn from the Northwest but a dark horse. He probably has the zombie voters vote. Is it Grande Ego to want to run for President? 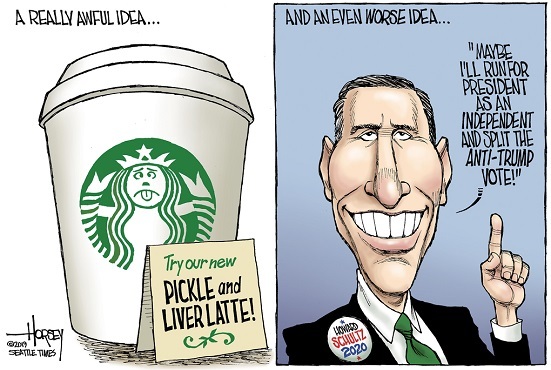 Howard Schultz needs to wake up and smell the coffee. Running as an independent may help relect Trump. In the 2000 presidential election in Florida, George W. Bush defeated Al Gore by 537 votes. Nader received 97,421 votes in Florida (and Pat Buchanan and Harry Browne received 17,484 and 16,415 respectively), which led to claims that Nader was responsible for Gore’s defeat. Do we want to repeat history with a third party “Independen” such as Schultz helping relect Twump? The voters who may choose Schultz seem very unlikely to vote for Nader. The voters who would choose Schultz may also help re-elect Trump. Why not run as a “moderate” progressive? D after the name not an Independent like Joe Lieberman, Bernie Sanders or the Green Party candidate Jill Stein.